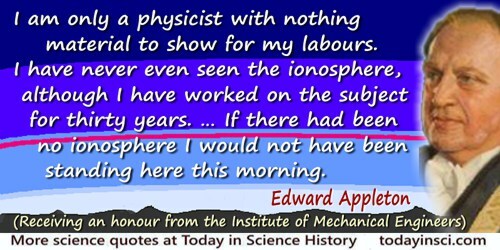 English physicist was awarded the 1947 Nobel Prize for Physics for his discovery (1926) of the Appleton layer of the ionosphere, a layer higher than the Heaviside Layer, electrically stronger, and consistently able to reflect short waves round the earth. In Presidential address to the Annual Meeting of the British Association (Sep 1947), as quoted in Brian Austin, Schonland: Scientist and Soldier: From Lightning on the Veld to Nuclear Power at Harwell: The Life of Field Marshal Montgomery's Scientific Adviser (2010), 459. 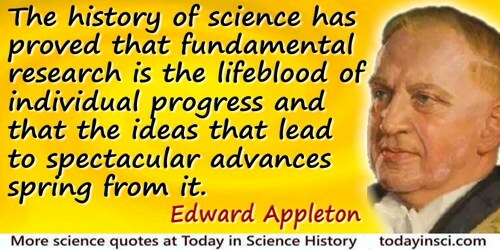 6 Sep - short biography, births, deaths and events on date of Appleton's birth. 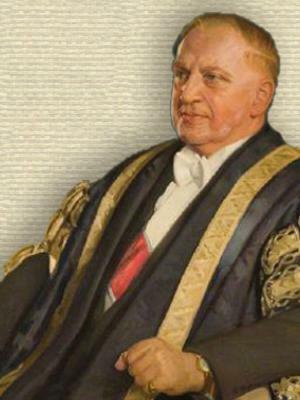 Sir Edward Appleton, by Ronald William Clark. - book suggestion.